Annual events need to spark interest year after year. With the Association of Midwest Museums' (AMM) conference traveling to a new state each year, it's important to engage not only the dedicated members but also intrigue potential new colleagues in the museum field. I was tasked with overhauling the event identity for the 2018 conference with the goal of reminding members that the Midwest does not have to mean small or conventional. The Association of Midwest Museums (AMM) works to connect museums across the eight-state region of the Midwest, including Illinois, Indiana, Iowa, Michigan, Minnesota, Missouri, Ohio, and Wisconsin. Their mission is to strengthen museums in the Midwest by providing nationally relevant, regionally specific programs, products, and networking opportunities. 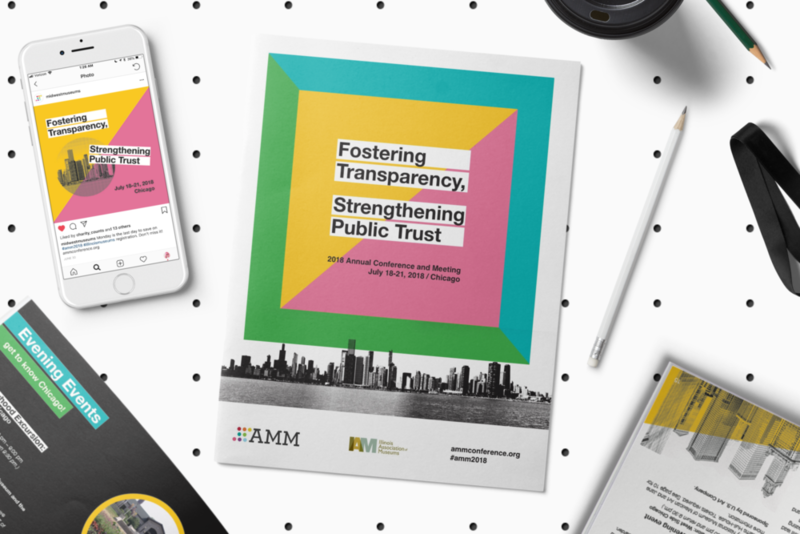 Through programs and activities, AMM encourages professional standards for all areas of museum administration and provides cutting-edge information and resources to museums and cultural institutions in the Midwest and the greater museum community. Their annual conference, hosted in a different state each year, draws over 400 museum professionals from the Midwest for several days of professional development, networking, and fun. Pulling from Chicago photography and sampling colors from vibrant urban murals and AMMs own identity, this event identity and subsequent collateral was designed to shake up the museum community and drive attention to AMM's lineup of influential and challenging speakers, workshops, and events. I was responsible for designing the identity, example social media posts, postcards, and the conference program.